In EM economies, this digital wave is just getting started. However, in the years ahead, we expect it to penetrate EMs at a faster rate than it did in DMs, and it will turn out to be a more powerful disinflationary force than that currently experienced by the latter. It is also possible that in the coming years, some of the largest and historically more high-inflation prone EM economies could experience further deflation, but of the good type, driven by the digital wave rather than weak demand. The first wave of global disinflation came from the globalization of trade. South Korea, a large emerging market, has the highest NDDEI score and therefore, currently faces the greatest digital disinflationary force, closely followed by Norway, Hong Kong, Sweden and Denmark. Companies can now quickly achieve economies of scale by accessing a global market that was unavailable before, and can save costs by automating production processes, arbitraging labor by outsourcing services; real-time inventory management and cutting out the middle man by selling directly to the customer. With information directly at their fingertips, consumers are provided with an abundance of choice, pricing knowledge and the convenience of shopping. While online sales were traditionally high in categories such as video, music, gaming and software, it has quickly spread to almost all goods and services, in some cases, providing immediate if not, same-day delivery. A key distinguishing factor of the digital wave is customer experience. 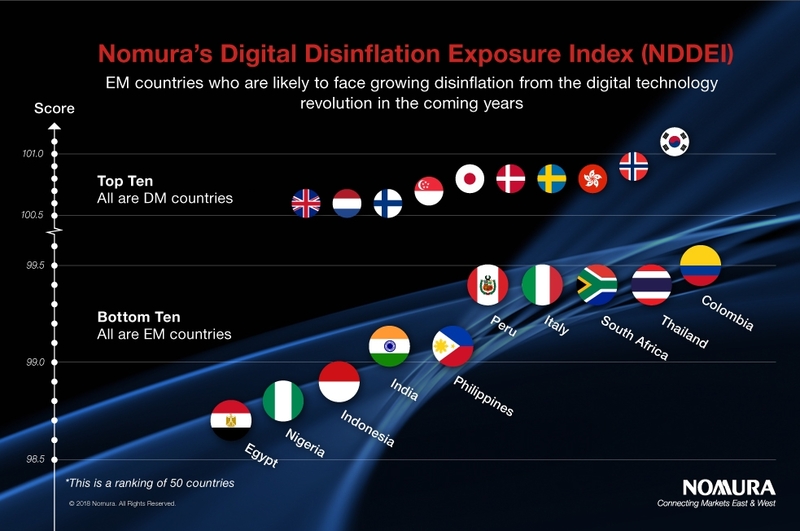 Read our report here for the full ranking of the Digital Disinflation Exposure Index.